Kick off your visit on the 12th (Fri): stroll through Geoffrey Bay, hunt for treasures at Horseshoe Bay Markets, then tour the water at your own pace with Big Mama Sailing, and finally identify plant and animal life at Nelly Bay to Arcadia Trail. On your second day here, admire all the interesting features of Magnetic Island Forts Walk, get engrossed in the history at Magnetic Island Museum, and then step off the mainland to explore Magnetic Island National Park. For where to stay, other places to visit, maps, and more tourist information, read Magnetic Island trip itinerary maker site . Toronto, Canada to Magnetic Island is an approximately 28-hour flight. Traveling from Toronto to Magnetic Island, you'll lose 15 hours due to the time zone difference. Plan for little chillier nights when traveling from Toronto in July since evenings lows in Magnetic Island dip to 17°C. Cap off your sightseeing on the 13th (Sat) early enough to travel to Port Douglas. Escape the urban bustle at Hartley's Crocodile Adventures and Scuba & Snorkeling. Take a break from Port Douglas with a short trip to Spas & Wellness in Palm Cove, about 42 minutes away. Spend the 16th (Tue) spotting exotic species with a safari tour. There's still lots to do: kick back and relax at Four Mile Beach. Do a combination of ferry, flight, and shuttle from Magnetic Island to Port Douglas in 5.5 hours. Alternatively, you can do a combination of ferry and car; or do a combination of ferry, bus, and shuttle. Expect a daytime high around 30°C in July, and nighttime lows around 20°C. 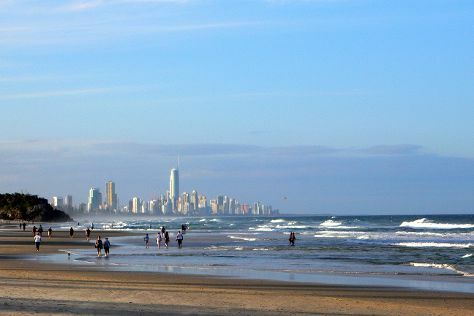 Cap off your sightseeing on the 16th (Tue) early enough to travel to Gold Coast. Kick off your visit on the 17th (Wed): tour the pleasant surroundings at Burleigh Head National Park, stroll through Kirra Beach, then tour the pleasant surroundings at Burleigh Heads Beach, and finally kick back and relax at Kurrawa Beach. Get ready for a full day of sightseeing on the 18th (Thu): explore the wealth of natural beauty at Natural Bridge. To see maps, traveler tips, more things to do, and tourist information, read our Gold Coast online tour builder . Do a combination of shuttle and flight from Port Douglas to Gold Coast in 6 hours. Alternatively, you can do a combination of shuttle, flight, and train; or drive. Traveling from Port Douglas in July, things will get slightly colder in Gold Coast: highs are around 24°C and lows about 11°C. You will have some time to spend on the 19th (Fri) before leaving for home.